Read the article below about Charles Darwin. Set yourself 10 minutes. He is most famous for a book he published in 1859. What do you know about him, or what led him to the theory he states in the book? Read on the find out. Charles Darwin is best known for his book On the Origin of Species by Means of Natural Selection, published in 1859. This challenged how people thought life was created and the age of the earth. His theory of evolution is still the accepted theory of the development of species. Darwin had intended to become a doctor; unfortunately he could not cope with the sight of blood, so instead went to Cambridge University to study Divinity, aiming for a career in the church. While he was at Cambridge he became interested in natural history, spending his free time searching for and collecting beetles. Around this time he discovered an expedition on the ship the Beagle was looking for a naturalist. Darwin got the position and they sailed on 27th December 1831. Darwin took Lyell's Principles of Geology to read on the trip. This book contradicted the accepted belief that the earth was created in 4004BC, as is described in Genesis. Lyell suggested that fossils found in rocks were evidence of animals having lived millions of years ago. He said the world hadn't been shaped by great catastrophes like floods but by the processes we see active today: wind, erosion, volcanoes, earthquakes, etc. Lyell offered not just a new geology but also a new philosophy of science. Slow gradual cumulative change over a long period of time could produce great effects. Darwin became convinced of Lyell's theory as he saw a wide variety of animals and geological features during the expedition. He became convinced of the evolutionary theory when he reached the Galapagos Islands, ten volcanic lumps 500 miles west of South America. The islands are home to Darwin's finches, a group of birds, which exemplified a gradual process, which became known as the 'survival of the fittest'. Although the birds were all finches, their beak size varied greatly. Today 14 different species have been identified. When he returned to England in 1836 Darwin tried to uncover the reason for this variation. He realised that the birds had not chosen to grow beaks of different sizes, and he rejected the idea that God had created the birds there to match the nuts found on the island. He thought the changes were entirely random. Darwin decided that some birds would be accidentally born with bigger beaks than others, on the island there were also some nuts which were big and hard. When food became scarce the birds with bigger beaks were able to get more food and so would grow bigger and stronger. These bigger beaked birds would then be able to live longer and have more offspring. This would be repeated in the next generation and so it was the 'survival of the fittest'. So the birds would evolve with big or small beaks depending on the food available in their environment. The implication was that as long as there was a limited food supply, heredity and a variation among the offspring there would be evolution. Darwin worked on this theory for the next twenty years, culminating in the publication of his book in 1859. The book created a lot of criticism because the logical extension was that Homo sapiens were not a special species and had probably evolved from the same common ancestor as apes. It also contradicted the commonly held belief at the time that God had created the world in seven days. Religious organisations were severely critical of his theory, which they claimed to be heretical. There are still some areas, especially within the United States' Bible belt region where Darwin's theory is not fully accepted or taught in schools. Darwin continued to publish papers and research his theory for the rest of his life. He died in 1882. Re-read the article and answer the following questions. 1. How old was Charles Darwin when the Beagle set sail? 2. Which geologist influenced Darwin? 3. What was No.2's philosophy of science? 4. Which animal helped Darwin begin his theory of evolution? 5. Where did he find this animal? 6. How many species of this animal (genus) have been identified to date? 7. What three factors did Darwin decide were needed for evolution? 8. What might we be evolved from? 9. What do you think of this theory? 10. What do think of the picture below? 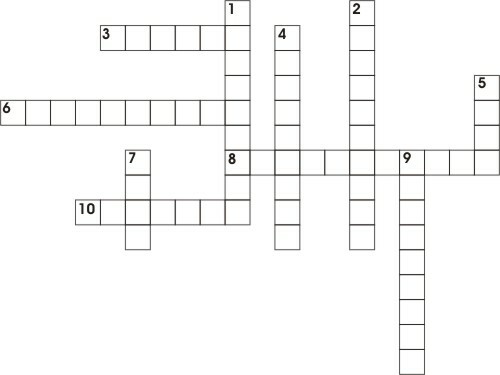 Below is a crossword. The definitions describe the words you need to put into the puzzle. Remember, one letter per square. The words are taken from the article. You should use a dictionary to help you check the correct word choice.